I've got a reasonably large species of predatory bird; mostly inspired by falcons, but larger. To give an idea of its physical size, my current working draft (which may very well change) is for a wing span of 150-250 cm or so (compare the gyrfalcon at up to 160 cm wing span). These birds are not intelligent on what might be considered a human scale. They do learn from experiences, but also operate to a large degree based on instinct, not dissimilar to birds on Earth. So that rules out any answer based merely on "because they choose to" (no deus ex machina). Answers need not be perfectly scientifically correct (I'm already taking some liberties elsewhere), but any suggestions should be plausible enough that a biologist or ethologist wouldn't throw a book out the window in disgust. Any ideas for what evolutionary pressure might meet my needs, what end results might be reasonable given such, and how those end results compare to the above criteria? I agree with two earlier answers (bait ball, attack large animals), in attacking larger animals you can employ the model of both wolves and lionesses: About half the predators lie in wait; the other half chase prey: The chasers have little to no chance of catching the prey on their own; but they are spread out and guide the prey, by fear, directly into the path of the ambush: The other half of their pack; which is fresh and collectively bring down the prey animal, with enough for all to eat their fill. Who chases and who waits can be a matter of age and experience; the young adults can make the attack; they are strong and fast reacting. Eventually they join the ranks of the chasers as those die or are lost to disease or injury. Chasing is less demanding than making the kill; the point isn't to actually catch or kill the prey. Chasers need to keep up, but mostly provide a reason for the prey to run away from them and toward the ambush. Although the idea of land animals is an obvious form of prey, I'd also think about them taking on an even bigger bird several times their own size; say one that feeds on fish, or is specially equipped to eat dangerous land animals that are too dangerous for your heroes to attack, but your heroes in a pack can take down the specialist and eat it, instead. Migration flocks occur with other birds too. I presume it is easier to find the way - the strength of the mass mind. Let me introduce you to the Harris Hawk. If you've ever been to a bird of prey centre or display they may be familiar to you as they are regularly used in falconry due to their intelligence and sociability. They are the only bird of prey known to hunt regularly as a group, admittedly of 2 to 7 rather than the large flock you are imagining, but it's a start. Unfortunately we don't really know why they do it, but it's speculated that it's more efficient and effective in the semi desert climate they often live in. They either take turns scouting out prey and then share their kills, or some birds flush out prey and the others take them down. They are quite comfortable on the ground too and they may often flush prey out from the ground for their airborne allies to kill. When used in falconry they are also known to be willing to tackle prey larger than themselves. So it's not entirely unknown or unreasonable to have sociable birds of prey that operate in groups. And if you put them in a harsh environment where most of the possible prey is quite large than it might be conceivable for groups of around 25 or more (250 might be pushing it, though maybe not) to work together to bring down quite large game and then share the feast. The bait ball mechanism is a plausible way that would encourage birds to form up. While this occurs in the oceans to an aquatic species, nothing prevents the analogy from being drawn to the air. Sardines normally migrate in large schools of millions of individuals. This makes them an attractive target for predators, which gang up on the bait ball and attack it cooperatively from all directions. Some of the predators include large predatory fish, birds, and even dolphins and whales. If a flying migratory prey animal exists in the world that travels in massive flocks and is a favourite prey species of the large birds, it would be a good reason for large predatory birds to feed on them in that manner. Working together to hunt down prey which is not only big as Catalyst suggested, but otherwise agile enough to escape a single attacker. This reminds me of a very creepy event. I was walking in the park when I saw a little green parrot, a rose-ringed parakeet, chased by a crow. The crow itself did not look like that it was serious about catching him, it looked more harassing. He dodged and finally sat down on a tree, only to be suddenly chased again from another crow. Intrigued I watched him settle down again and I saw that while the chasing crow flew to another tree a third crow flew up and moved to the parrot tree dead on target. I looked around and saw a dozen crows positioned in the park so that they surrounded the area and could keep track of the parrot. While it could have a coincidence I really had the feeling that the crows were hunting down the parrot as sport. 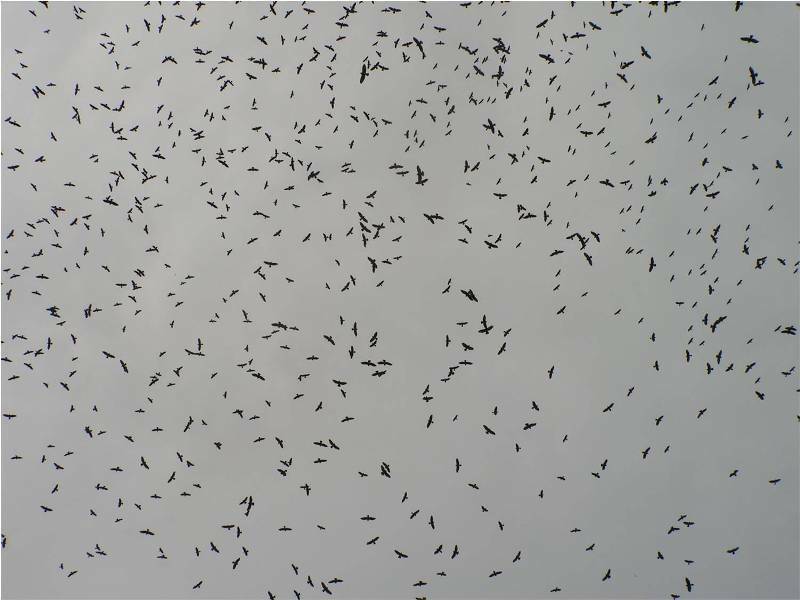 They may form large flocks for various reasons while nesting, and remain in the flocks for the rest of the year simply because there is no reason to disperse and then re-group. It may be interesting (and counter-intuitive) that non-predatory birds often form flocks when food is scarce, not plentiful - for example in winter. It may be more beneficial that the whole of the flock gets something to eat when there is a food shortage, instead of individuals either finding more food than they can eat, or nothing at all. Or a flock might form simply because one bird sees another one feeding, and goes to joins it. Falcons would be an exception to this, though. Catching prey is almost entirely a one-on-one contest - it doesn't seem probable that a flock of falcons could coordinate their actions in a useful way while diving on prey at 100 to 200 mph, for example. Would a 2.8 meter wingspan be too big for your needs? Check out the Griffon Vulture in the hills around Ronda in Southern Spain. Although usually a carrion eater, they have been known to combine their efforts to take down livestock. They flock from small family groups of three or four up to huge groupings of hundreds if not thousands. Why do they flock? For all the same reasons any other social birds tend to flock. Being a predator does not mean being a loner. Even lions work best in prides. You could have the birds mate, lay and hatch an egg, then have both the parents raise the children for x amount of time. Although obviously flightless, which isn't very fun, they are predatory birds that form huge flocks, such as Zavadoski Island with 1 million pairs of birds! Why do our current birds form flocks? There's safety in numbers! So while your species is a predatory one, maybe it's still not on the top of the food chain? If there was an even bigger predatory bird that they'd have to avoid, it'd make perfect sense to form flocks. A flock can keep eyes to all directions and can defend themselves against a bigger foe. Not the answer you're looking for? Browse other questions tagged reality-check creature-design avian or ask your own question. Under what conditions would humanoids evolve eyes in the backs of their heads? What environmental pressures might cause rodents to evolve social behavior? Will my bird likely be able to fly in this atmosphere on this planet?